We are currently finishing off our report Telcos Role in the Advertising Value Chain with support from Alan Patrick at Broadsight. It has been fascinating looking at the relatively new, but fast-growing, on-line advertising market and the nascent mobile advertising industry. 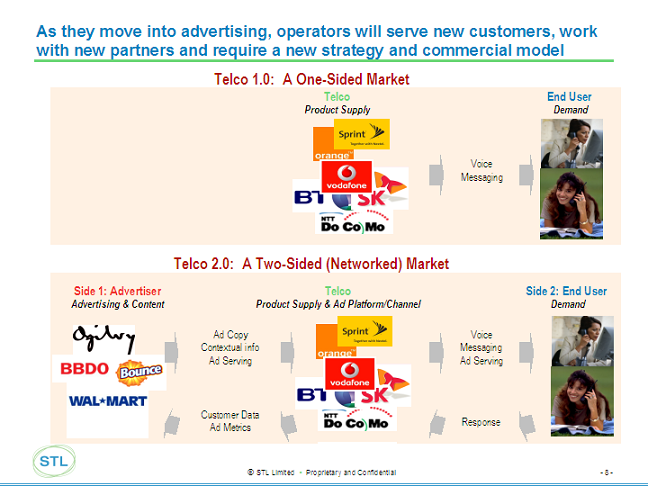 We have taken a telco-oriented approach to these markets and explored how operators might add value to what already exists (what problems do the Content and Advertising communities face that the telcos could address?) and what strategies they need to adopt to be successful in a 2-sided marketplace. End Users who wish to consume content and respond to advertising as well as use traditional operator services. Operator services may or may not be subsidised by the advertising. Operators can choose to provide value to consumers for other people’s products and services (e.g. discounted meals) or their own products and services (e.g. discounted/free voice and messaging services) as with Blyk. The 2-sided advertising market is substantially more complex than simple content distribution because the Advertisers will require substantially more information back from the operators and advertisers will pay operators for access to the platform - they are customers not suppliers. In return for payment, they will seek customer data and ad performance information from Telcos as well as ad-serving capabilities. But if Operators can get the Advertising model right, it could provide the impetus to grow the content market itself by increasing the volume and reducing the cost of content. What sort of platform is needed to bring advertisers and consumers together - proprietary vs open, make vs buy/partner? What products/services/activities to provide in the platform - ad-serving only or a wider range of ancillary services? Whether to subsidise Telco products with advertising (ad-funded services) OR help others to reach consumers more effectively (enable others to subsidise their products/services) OR do both? How to price services for both sides of the market? How to avoid being enveloped by rival platforms? We will be debating these and other issues at a workshop on 29th March in London as part of the Telco 2.0™ Industry Brainstorm event. The Advertising day is invitation-only, as we want to get the right people along from operators, internet players and the advertising world. I have sent invitations out to a number of people, together with a link for registering. If I have missed you out and you would like to attend, then contact me and I will send you the link to the registration page. What sort of platform - proprietary vs open, make vs buy/partner? I am not going to give you the STL Telco 2.0 response to all the questions - you can buy the report and/or attend the workshop for that. But let’s take a look at the kind of platform that operators might want to develop or participate in. 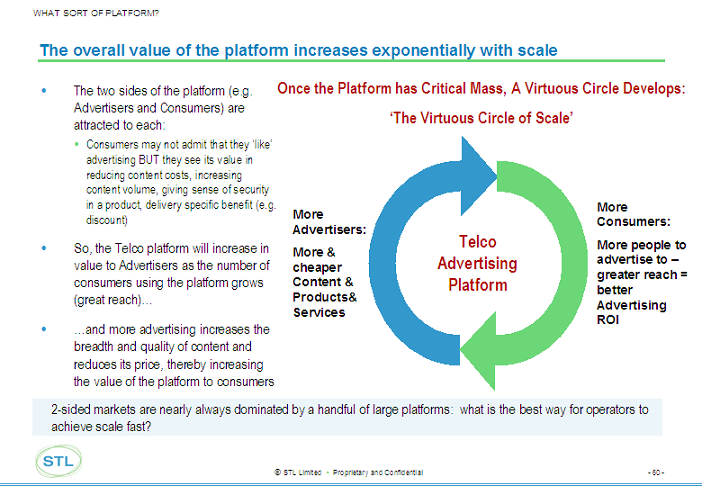 The first thing to be aware of is that in a platform world scale is king (see chart below). If operators can’t develop or participate in a platform that brings together large numbers of uses and advertisers then they will fail (either individually as a company or collectively as an industry). So which is the right one? Well in the report we have a set of structured evaluation criteria and I am not taking you through them all here. 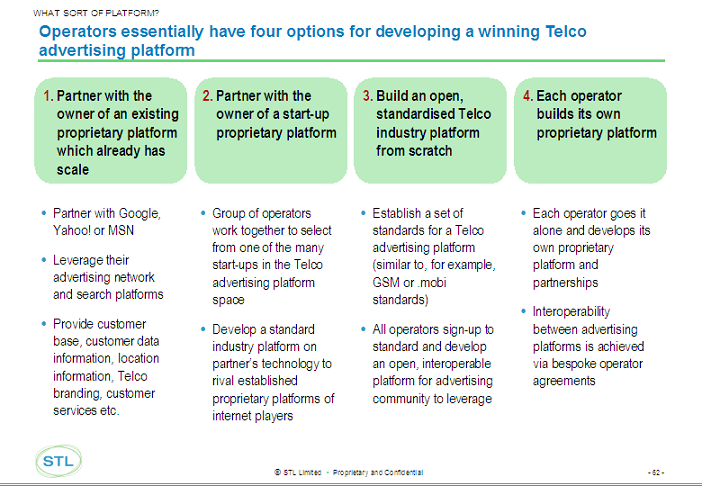 But, suffice to say, our view is that if the Telco communities want to go down a proprietary route, then they need to partner with an existing big platform player. We have identified a number of risks with this approach and suggest that if this is the chosen option then Telcos execute this partnership very carefully to avoid being marginalised. Caveat emptor applies when partnering with the internet players in this space. If operators elect for an open platform and develop a shared set of standards then we believe the upside is potentially higher for them - a bigger slice of a big pie. But the execution risks of this approach are probably higher as delays in developing the standard platform could mean they miss the boat altogether. I am looking forward to feedback, discussion and debate when we present our research on this at the workshop.